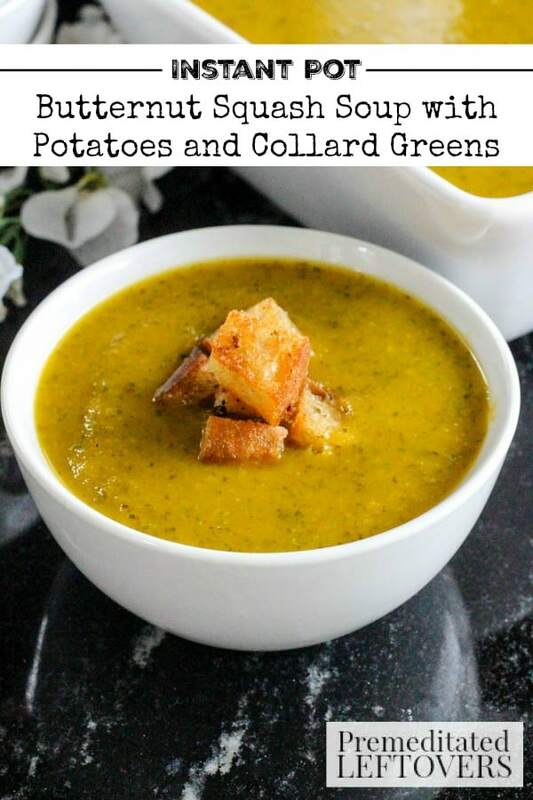 Use your instant pot to make this delicious Butternut Squash Soup with Potatoes and Collard Greens. It is a hearty soup that is perfect for the cold winter months ahead. If you want to taste Autumn in a bowl, all you need is a spoonful of this Butternut Squash Soup with Potatoes and Collard Greens. It is hearty and delicious and so super easy to make. You can make it start to finish in just under an hour. This soup isn't as sweet as a typical butternut squash soup. In this recipe, the addition of roasted potatoes and the rustic flavor of collard greens create a great balance of savory flavors. And another great point about this soup is that it's very easy to make something so remarkably good. 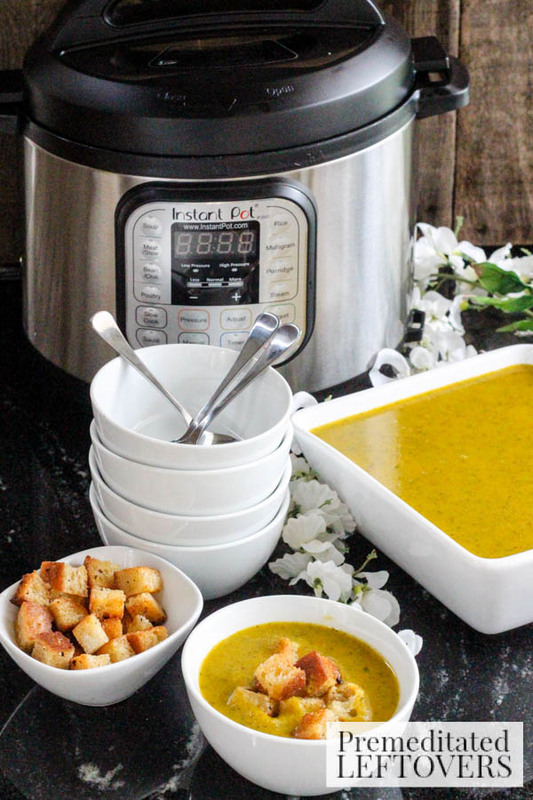 I used an Instant Pot and a wand mixer to make this delicious soup and it sure beat the way I used to make soup. No more pouring cupfuls of liquid into a blender and having it leak every which way. Using the Instant Pot was by far the easiest mess-free way to make this. I used one medium size butternut squash, about a pound and a half of small gold and red creamer potatoes, and two and one-half cups of chopped collard greens. I also threw in three roasted peppers. Two Hungarian wax and one Anaheim pepper. To bring it all together I poured in six cups of unsalted chicken stock. This soup is perfect for the coming winter and endless cold weather. 1. Remove the lid on the Instant Pot and add a single tablespoon of EVOO and press the sauté bottom on the Instant Pot. 2. When the oil is hot add the potatoes and a single tablespoon of unsalted butter. Allow the potatoes to brown, adding a pinch of sea salt and freshly ground black peppercorns. 3. Place the lid on the Instant Pot and lock. Press the pressure button and allow the potatoes to cook for 10 minutes. Release the steam and remove the lid. 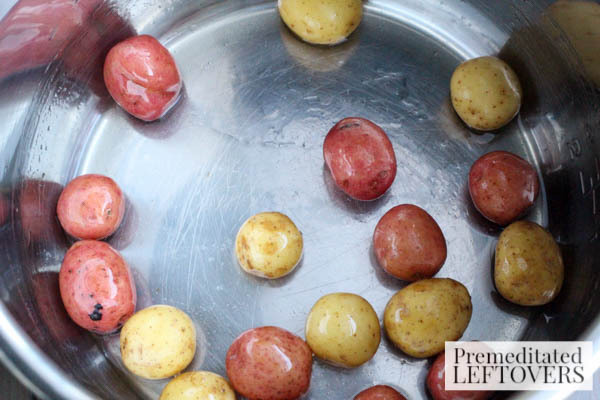 Place the potatoes in a bowl and set it aside. 4. Keep the setting on sauté and add the peppers. Allow the peppers to cook down and char a bit. Remove the peppers to a bowl or plate and remove the stem and seeds. 5. Next, wipe the pot clean and add another tablespoon of EVOO. Press the sauté button, when the oil is hot add the chopped collard greens sauté the greens until they are bright green and tender (about 5 minutes). Add sea salt and freshly ground black pepper to taste. Remove the collard greens from the pot and place them into the bowl with the potatoes. 6. Peel and remove the seeds from a medium size butternut squash. Cut the squash into 1″ x 1″ cubes, they will cook faster this way. Add a tablespoon of EVOO and a single tablespoon of unsalted butter. Press the sauté function again. When the oil is hot and the butter has melted add the pieces of squash, allow the squash to brown slightly. Adding a pinch of sea salt and freshly ground black peppercorns. Place and secure the lid and select the pressure setting, and cook the squash for 5 minutes. Vent the pressure and remove the lid. 7. Add the peppers, potatoes, and collard greens to the squash. Then add six (6) cups of chicken broth. Using the wand or hand held mixer begin breaking down the cooked squash, peppers, potatoes and collard greens. Continue to pulse until the mixture is smooth. Press the sauté button and bring the soup to a boil for ten minutes. Place the lid on the Instant Pot and allow the soup to steep for 15-minutes. 8. Add sea salt and freshly black peppercorns to taste. What is your favorite go-to cold weather soup, stew, or comfort food? We would love to hear about it. Let me know in the comments below. Remove the lid on the Instant Pot and add a single tablespoon of EVOO and press the saute bottom on the Instant Pot. When the oil is hot add the potatoes and a single tablespoon of unsalted butter. Allow the potatoes to brown, adding a pinch of sea salt and freshly ground black peppercorns. Place the lid on the Instant Pot and lock. Press the pressure button and allow the potatoes to cook for 10 minutes. Release the steam and remove the lid. Place the potatoes in a bowl and set it aside. Keep the setting on saute and add the peppers. Allow the peppers to cook down and char a bit. Remove the peppers to a bowl or plate and remove the stem and seeds. Next, wipe the pot clean and add another tablespoon of EVOO. Press the saute button, when the oil is hot add the chopped collard greens saute the greens until they are bright green and tender (about 5 minutes). Add sea salt and freshly ground black pepper to taste. Remove the collard greens from the pot and place them into the bowl with the potatoes. 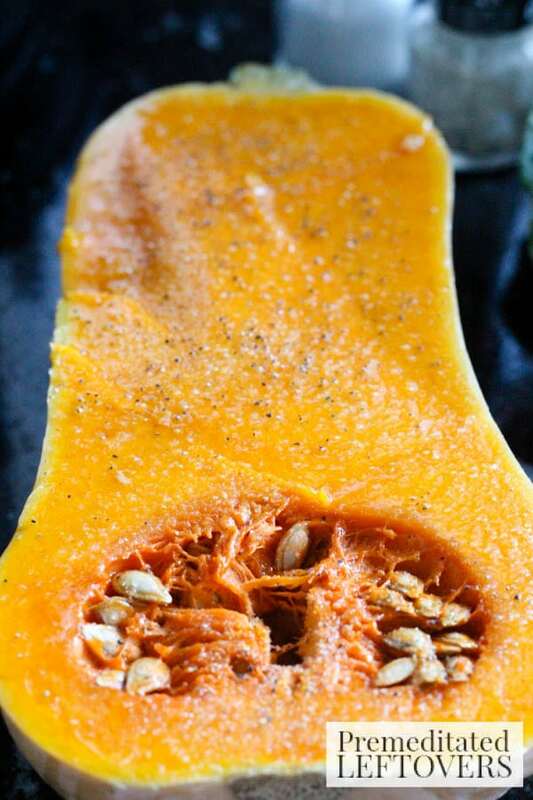 Peel and remove the seeds from a medium size butternut squash. Cut the squash into 1" x 1" cubes, they will cook faster this way. Add a tablespoon of EVOO and a single tablespoon of unsalted butter. Press the saute function again. When the oil is hot and the butter has melted add the pieces of squash, allow the squash to brown slightly. Adding a pinch of sea salt and freshly ground black peppercorns. Place and secure the lid and select the pressure setting, and cook the squash for 5 minutes. Vent the pressure and remove the lid. Add the peppers, potatoes, and collard greens to the squash. Then add six (6) cups of chicken broth. Using the wand or hand held mixer begin breaking down the cooked squash, peppers, potatoes and collard greens. Continue to pulse until the mixture is smooth. Press the saute button and bring the soup to a boil for ten minutes. Place the lid on the Instant Pot and allow the soup to steep for 15-minutes. Add sea salt and freshly black peppercorns to taste. This recipe sounds great. What are Hungarian waxed peppers. Are they fresh peppers in the produce section? What is a substitute for them – I have never seen them. Thanks. An important safety note: you can’t turn on the instantpot pressure setting without liquid as you seem to suggest to cook both the potato and the butternut squash. You must add water to create steam and hence pressure within the device. Please correct you recipe accordingly for safety. Catt. Hungarian Wax pepper is very similar to a Banana pepper in how it looks. However, it is a lot lot hotter. So, if you don’t want or like a lot of heat I suggest using a Banana pepper instead. Brooklyn, allow me to clarify. I used a conventional oven to cook the Butternut squash and not the Instant Pot. However, I did use the Instant to cook the creamer potatoes using a bit of olive oil and sea salt and black pepper. This sounds wonderful! I love squash, and this recipe seems to be very allergen free (at least for my family!) Pinning! Thanks for sharing at #HomeMattersParty! I lovely fall soup. 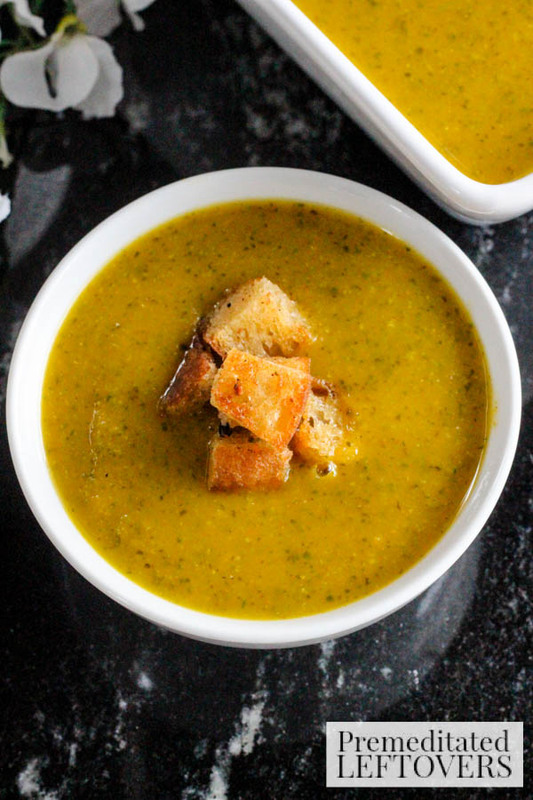 I love roasting butternut squash and then making soup when the weather gets chilly! Thanks for sharing at Welcome Home Wednesdays! See you tomorrow.